If you were living in a cave for the past several years and were none the wiser, you might pop your head out for some fresh air, see the headlines from this week and decide to stay put. The largest point drop in history, followed by another 1,000 point plunge, and a CNBC “Markets in Turmoil” special? No, thanks – sounds like a repeat of 2008 or the dotcom bubble popping. I think I’ll sit this one out. So, to recap, we have a natural, biological attraction to fear and it may cause us to do irrational things. That helps news ratings and gets us to buy stuff we don’t really need (from multivitamins to extended warranties on TVs), but it’s a recipe for disaster when it comes to your investment portfolio. You probably didn’t notice the CNBC “Markets in Euphoria” special after the S&P 500 began the year by gaining nearly 7.5%. That’s because there wasn’t one. When the S&P 500 closed every single month of 2017 with positive gains (by the way, including January, stocks have now increased in 22 out of the last 23 months), guess what? No CNBC special. That’s not to pick on CNBC. Fear sells and the financial media is looking for clicks and eyeballs. Social media magnifies the situation. “Largest point drop in history” screams the headlines. Well, yeah, that’s true if you’re talking actual points. But on a percentage basis, according to S&P Dow Jones Indices, Monday was only the 100th largest decline (the S&P 500’s drop was the 127th largest). Thursday’s declines were obviously somewhere lower than that. Not so scary. Retirement savers violated a cardinal rule of investing this past week: they sold into a plunging market. After racing into equities in January, they did an about-face as markets fell on Friday Feb. 2. Savers moved into money and fixed-income funds, trading at close to three times the norm, according to Alight Solutions’ 401(k) Index. On Monday, when the Dow Jones Industrial Average plummeted 1,175 points, they repeated the pattern, this time trading at 12 times the typical pace. The next day, as the market recovered some losses, 401(k) savers kept selling stocks, trading at a rate of four times the usual. Look, a 10% drop in stocks can certainly be a little painful and get your attention. Stocks could decline further and stay down for an extended period. However, some historical perspective is helpful here: over the past 38 years, the average intra-year drop in the S&P 500 has been 13.8%! 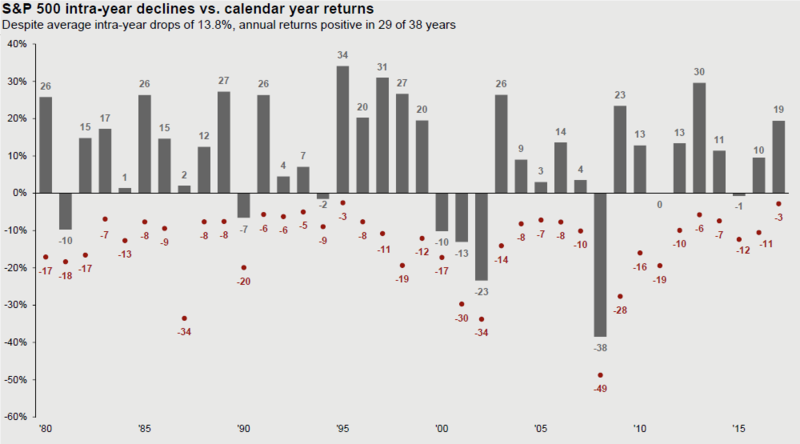 Look closely at the red dots on the following chart, which show the largest decline in each year. What we are currently experiencing is normal. It may get worse, it may not. But, remember, fear sells. Headlines like “Markets experience normal, 10%+ intra-year decline” don’t generate the same kind of advertising revenue. That’s not to say fear has no value. If you weren’t afraid of touching a hot stove, you would burn your hand. Fear helps protect us from legitimate threats. The problem is that a primal, fight-or-flight response is great to help keep you alive in the jungle, but not so helpful when managing an investment portfolio. As a matter of fact, in the context of investing, succumbing to or operating from a position of fear is the threat. Each of us has our own unique world experiences which shape our specific fears. Some of these fears ultimately manifest themselves in our tolerance for investment risk. There’s nothing wrong with that. The key is to avoid allowing outside influences to calibrate your portfolio risk for you. It’s one thing for a naturally fearful investor to have a longer-term allocation to a conservative portfolio. It’s another thing entirely for a truly aggressive investor with a twenty-year time horizon to whipsaw themselves in and out of a growth portfolio based on financial media bluster. 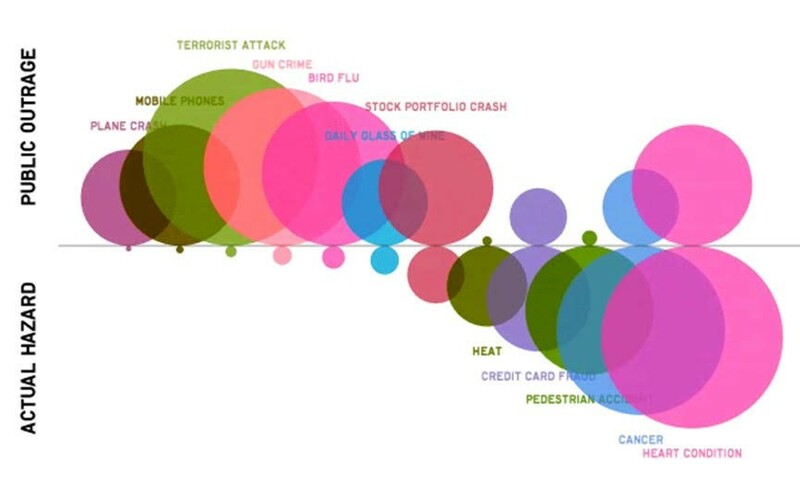 I’ll leave you with one of my favorite charts courtesy of Barry Ritholtz, which essentially shows media/public attention compared to actual risk for a variety of common fears (some of which have a legitimate basis and others not so much). Food for thought. The best thing to do is recognize that we all have an attraction to fear and it can cause us to do irrational things. Take a step back and face those fears. It will help you put the stock market into proper context.